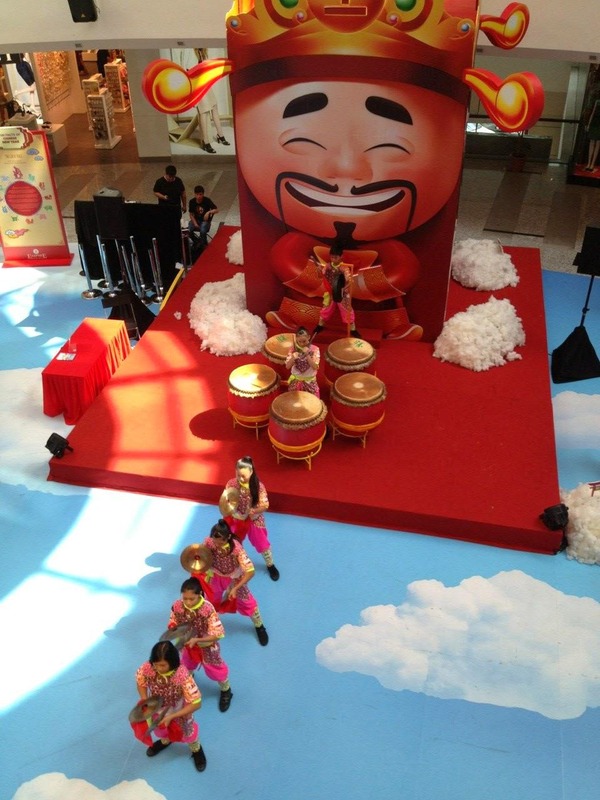 This is our pre-Chinese New Year meeting in the year 2015 and we resolved to be “Happy, Healthy and Wealthy” as our club has definitely “flourished” since we ushered in the year 2015. First and foremost, we cordially welcomed Michael Wong, ACB, CL from REAL Toastmasters Club, our baby-minder and frequent visitor to our club as our General Evaluator. Thank you, Michael for being with us! We also welcomed our Toastmasters guests, Dr. Alvin Teoh, ACS from Sunway Toastmasters Club, Ler Kiat See from Sime Darby Healthcare Toastmasters Club and her colleague and friend, Tee Bee Ling, and most of all Ken Chan, DTM, our special speaker for this meeting and his mentee, Hans Tan, both from Money Mastery KL Toastmasters Club. With all these happy and propitious guests with us, we had a very exciting, eventful and fulfilling meeting. We are also glad to announce that Irene Han joined our happy Extol family at this meeting!! The meeting was called to order by ASA, Pei San at 7.10pm. Well done, San! TME, Ken Koh, ACB, efficiently and effectively managed the whole meeting. Excellent job, Ken! All were encouraged by President, Jeannie, ACS to exercise positive thoughts when we arise each morning to invite good vibes into our lives so as to stay “Happy, Healthy and Wealthy” and our lives will definitely “flourish”. Thank you, Jeannie! Invocator, SK Ratnam, DTM inspired us with motivating, captivating and interesting sayings by great men. Thank you, SK! Table Topics Master, Dr. Alvin Teoh, ACS gave controversial, paradoxical and challenging topics which did not deter five enthusiastic, spirited and indomitable spontaneous speakers. Very innovative, Dr. Alvin! Shel Ling, DTM, attempted the paradox that “Beauty is in the eyes of the beholder, but beauty is a standard” with finesse by disputing that beauty is not purely physical but involves deeper, profound, inner beauty that lasts. Ler Kiat See challenged the topic that “People said money doesn’t grow on trees but I said it can” incredibly well by converting all money making devises into trees. Francis Pang, confronted head on that even though “people said money can’t buy love but I said it can” by relating how sometimes love can be purchased by men who bought foreign brides. Ravi had to twist his logic with “Don’t think out of the box but you have to think out of the box”, extremely well by contrasting it with his frog in the well story. And the best Table Topics Speaker went to Shel Ling, DTM. Congratulations, Shel! Humour Master, SK Ratnam, DTM set everybody laughing with three humourous stories about his dog which can count, a widowed brother and the lady who repaired our timing device. You are the greatest joker, SK! Table Topics Evaluator, Kwa Ngan Eng, DTM, evaluated succinctly all the five brave spontaneous speakers providing praises and points for improvement where warranted. Fabulous job, Ngan Eng! Pei San presented CC#5 titled, “How to break your bad habits” offering four suggestions to successfully eliminate bad habits and to reward ourselves to prevent recurrence of our bad habits. Remarkable speech, San! Her evaluator, Jeannie, ACS was impressed with her speech which was very well prepared and delivered effectively. Thank you, Jeannie! Second speaker, Pun Yew Kee presented CC#8 titled, “Perils of smoking”, which was very informative and highlighted the destructive results of smoking cigarettes! Well done, Yew Kee! His evaluator, Kwa Ngan Eng, DTM was happy with his speech which met the speech objectives. Thank you, Ngan Eng! Ken Chan, DTM presented the Special talk from the Better Speaker Series, ”Controlling your fear” which provided us tips, methods and ways to improve as a public speaker. Thank you, Ken! As there were only two project speakers, there was no voting for best speakers and evaluators. Ah Counter, Mohmmad Muslim efficiently reported all the word crutches of the speakers during the whole meeting. Very attentive role player, Muslim! Hans Tan, the Grammarian presented a very concise report of all creative usage and also wrongful usage of words and sentences by the speakers. Bravo, Hans! Karren Lim, the Timer, was very attentive and gave a precise timing report of the whole meeting! Kudos, Karren! Francis Pang, the Listening Evaluator gave ten very complicated questions but miraculously, SK Ratnam, DTM got eight correct answers and was awarded the Best Listening award. Stupendous job, Francis and congratulations, SK! General Evaluator, Michael Wong, ACB, CL was very happy to visit our club again as General Evaluator although he professed that he preferred to be a “test speaker”. Thank you, Michael, you are always welcome at our club! President, Jeannie, ACS announced that our next meeting on 18th February 2015 will be cancelled as it falls on Chinese New Year eve. 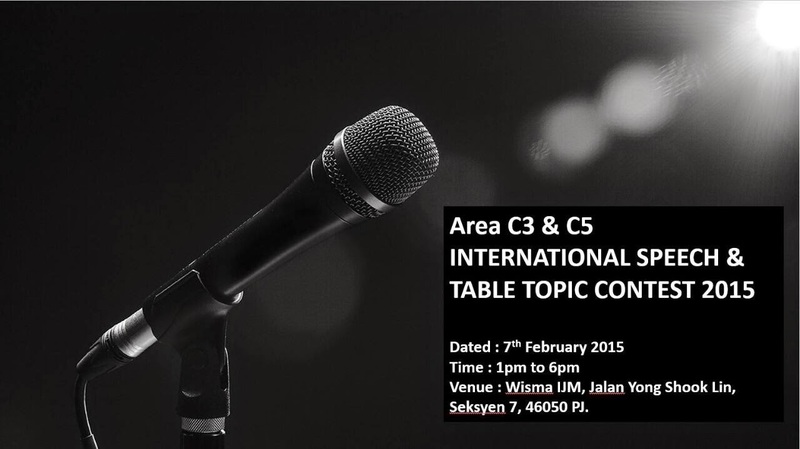 She also announced that the Area C5 International Speech and Table Topics Contests will be held on 7 February 2015 at Wisma IJM, Jalan Yong Shook Lin, Petaling Jaya at 12.00noon. All club members are encouraged to go and support our club champions! Goodnight and see you at our next meeting on 4th March 2015!